Challenge yourself to ride 500km with Rapha in the eight days between Christmas Eve and New Year's Eve. Share your #Festive500 stories to win prizes, and complete the challenge to earn a coveted woven badge. Find out more at rapha.cc/festive500. In 2010, Rapha laid down a challenge: Ride 500km over the eight days between Christmas Eve and New Year’s Eve. Since then, the #Festive500 has become a holiday tradition, with tens of thousands of cyclists around the world taking part. Start your 2018 strong with 500km in the legs and plenty of memories to share. Be sure to send Rapha your #Festive500 stories from the road for a chance to win something special including a Rapha Travel vacation and a 3T bike. Additional information about Rapha can also be found at their Strava Club. All challenge finishers will earn a complimentary woven badge from Rapha as well as a digital trophy for their collection. Participants must visit Rapha's website to redeem their prize. Additional information will be shared upon completing the challenge. A digital completion badge upon finishing the challenge. A Rapha woven badge to commemorate your achievement. Additional information will be communicated once 500km has been ridden. Special prizes awarded to riders who submit stories, films, and artwork that embody the spirit of the #Festive500. Prizes this year include a 3T Exploro Team bicycle, a Rapha Travel trip, a Leica camera and a Wahoo bundle. 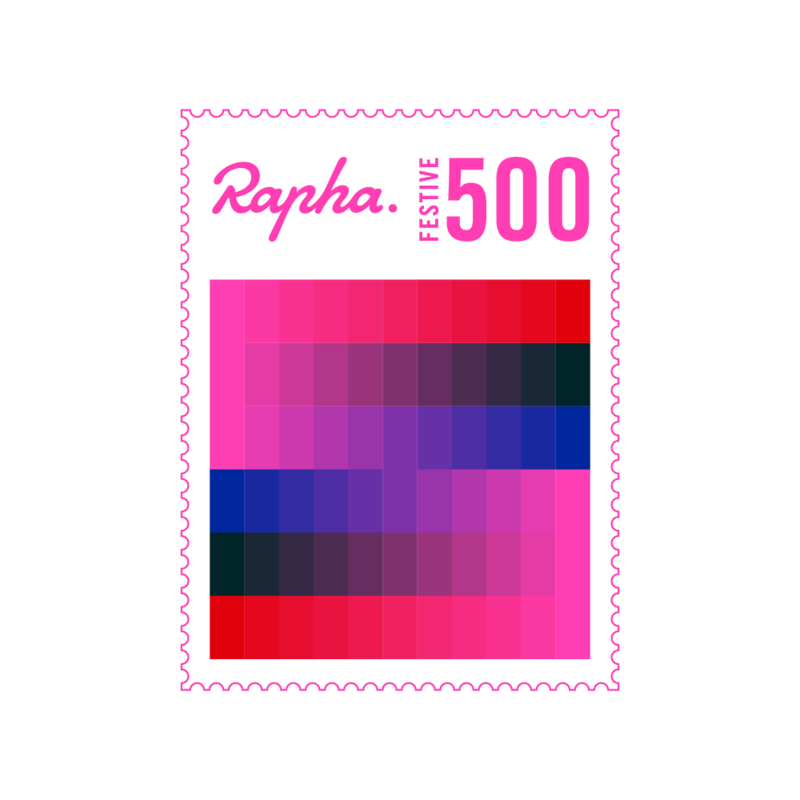 To find out how to enter, visit rapha.cc/festive500. Manual entries and trainer rides will not count towards your challenge effort. NO PURCHASE NECESSARY TO ENTER OR WIN. A PURCHASE WILL NOT INCREASE YOUR CHANCES OF WINNING. VOID WHERE PROHIBITED OR RESTRICTED BY LAW. Rapha (“Sponsor”) is pleased to introduce the Rapha Festive 500 challenge (the “Skill Challenge”) made available at www.strava.com (the “Site”). As a condition of participating in the Skill Challenge, entrant (“You” or “Your”) agrees to be fully and unconditionally bound by these Official Rules and the decisions of Rapha, whose decisions shall be final and binding in all respects, and to waive any right to claim ambiguity in the Skill Challenge or these Official Rules. 2. HOW THE SKILL CHALLENGE WORKS: You may enter the Skill Challenge by going to the Site on or before 12/31/2017, clicking on the corresponding Skill Challenge URL that will direct You to the Skill Challenge landing page, where You will be entered into the Skill Challenge by clicking on the Join button. Starting from the day the Skill Challenge begins on 12/24/2017, you have until 12/31/2017 to ride 500 km. Each activity (Run or Ride) must be logged on the Site and cannot be inputted manually. For more information regarding how to log activities on the Site, please see Strava’s How It Works page (http://www.strava.com/how-it-works). If You successfully ride 500 km between 12/24/2017 and 12/31/2017, You will be a prize winner, subject to Sponsor’s verification. Any form of entry and participation in the Skill Challenge other than that described herein is void. 4. PRIZE RESTRICTIONS: Limit one (1) prize per person. No transfer, substitution or cash equivalent for prize will be made, except that Sponsor, at its sole discretion, may substitute a prize (or component of prize) of equal or greater value for any reason. Any depiction of prize, in Skill Challenge materials or otherwise, is for illustrative purposes only. All prizes are awarded AS IS and WITHOUT WARRANTY OF ANY KIND, express or implied, (including, without limitation, any implied warranty of merchantability or fitness for a particular purpose) by Sponsor. Prizes will be sent to the address on file with Sponsor at the time Your prize is won. Please be certain to keep Your address up to date. All prizes, including prizes shipped outside of North America, will be sent via U.S. Postal Service with the appropriate international postage (where applicable). We assume no liability for non-deliverability. In order to avoid shipping goods outside the U.S., Sponsor reserves the right to ship the Approximate Retail Value of the item via check or alternate payment as a substitute for the merchandise prize UP TO A MAXIMUM VALUE OF $350 USD. Sponsor reserves the right to cancel the Skill Challenge for any reason. In the event that the Skill Challenge is cancelled or postponed for any reason whatsoever, the ARV of the prizes will be awarded to the extent required by law. Sponsor also reserves the right to remove from or to deny entry to the Skill Challenge to any entrant who engages in a non-sportsmanlike or disruptive conduct, or acts with the intent to annoy, abuse, threaten or harass any other person participating or involved with the Skill Challenge. ALL TAXES ARE THE SOLE RESPONSIBILITY OF THE WINNERS. Any required tax reporting forms will be furnished to the appropriate tax authorities. 5. ODDS OF WINNING: The odds of winning will depend upon an entrant’s ability to complete the Skill Challenge. 6. WINNER NOTIFICATION: Sponsor will announce the potential winners of the Skill Challenge within one (1) week after the conclusion of the Skill Challenge on 12/31/2017. All potential winners will be notified via the email address associated with the potential winner’s account and will be posted on Sponsor’s Site (https://www.strava.com/challenges/rapha-festive500-2017). Prizes will be deemed to have been won when all conditions in these Official Rules and accompanying Terms (http://app.strava.com/terms) are met. ALL POTENTIAL WINNERS ARE SUBJECT TO VERIFICATION BY SPONSOR, WHOSE DECISION IS FINAL. AN ENTRANT IS NOT A WINNER OF ANY PRIZE, EVEN IF THE SKILL CHALLENGE SHOULD SO INDICATE, UNLESS AND UNTIL ENTRANT'S ELIGIBILITY AND THE CORRESPONDING COMPLETION OF THE SKILL CHALLENGE HAVE BEEN VERIFIED AND ENTRANT HAS BEEN NOTIFIED THAT VERIFICATION IS COMPLETE. Potential winners may, at the option of the Sponsor, be required to complete and sign an Affidavit of Eligibility and Liability Release, where legal, a Publicity Release, and IRS Form W-9. Failure to complete such forms within seven (7) days of receipt of such request will result in forfeiture of the prize. If a potential winner is not of the legal age of majority in the state of residence (""minor""), these documents may be required to be confirmed and signed by the potential winner's parent or legal guardian, and the prize may be awarded in the name of his/her parent or legal guardian who will be required to fulfill all requirements imposed on winner set forth herein. In the event of non-compliance with these Official Rules, or if the prize is unclaimed or returned as undeliverable, the prize will be forfeited. Any forfeited prize may be awarded to an alternate winner, at Sponsor's discretion. 7. PUBLICITY RIGHTS: Except where prohibited by law, by entering the Skill Challenge, and as a condition of participating in this Skill Challenge, entrant agrees to allow Sponsor and/or Sponsor's designee the perpetual right to use his/her name, biographical information, photos and/or likeness, statements, voice and city and state address for advertising and promotional purposes for this and similar challenges, worldwide, and in perpetuity, in any and all forms of media, now known or hereafter devised without additional compensation, review or approval rights, notification or permission, except where prohibited by law. ENTRANT FURTHER ACKNOWLEDGES THAT IF ENTRANT IS DETERMINED TO BE A WINNER, ENTRANT’S PERSONAL IDENTIFYING INFORMATION MAY BE DISCLOSED TO THIRD PARTIES INCLUDING, WITHOUT LIMITATION, PLACING ENTRANT’S NAME ON A WINNERS' LIST. 8. WINNERS’ LIST: To obtain the names of the winners, any person may mail a self-addressed, stamped envelope after 30 days from the conclusion of the Skill Challenge to Rapha Attn: Winners’ List. Requests must be received no later than three (3) months after the conclusion of the Skill Challenge. 9. LIMITATIONS OF LIABILITY: Sponsor and the Released Parties (defined below) are not responsible for: (1) stolen, lost, late, misdirected, damaged, undeliverable or incomplete, inaccurate, delayed, illegible entries due to technical, computer, mechanical, printing, typographical, human or other errors relating to or in connection with the Skill Challenge, including, without limitation, errors which may occur in connection with the administration of the Skill Challenge, the mailing or transmission of entries, notification or correspondence, the processing of entries, the logging of miles, the announcement of the prizes or in any Skill Challenge related materials; (2) technical failures of any kinds; (3) failures of any of the equipment or programming associated with or utilized in the Skill Challenge; (4) unauthorized human and/or mechanical intervention in any part of the entry process or the Skill Challenge; (5) technical or human error that may occur in the administration of the Skill Challenge, the sending of entries or the processing of entries; or (6) any injury or damage to persons or property that may be caused, directly or indirectly, in whole or in part, from entrant's participation in the Skill Challenge or receipt or use of any prize. If for any reason an entrant's entry is confirmed to have been erroneously deleted, lost or otherwise destroyed, corrupted or for any other reason not accepted as an entry into the Skill Challenge, entrant's sole remedy is to enter again into the Skill Challenge. Sponsor may rescind any Skill Challenge entry found to contain such errors or failures without liability at its sole discretion. As a condition of participating in the Skill Challenge, entrant agrees to release, indemnify and hold harmless Sponsor and its respective affiliates, prize suppliers, and Sponsor’s business partners and all their affiliates, and each of their respective agents, representatives, officers, managers, directors, members, shareholders and employees (the “Released Parties”) from and against any injuries, losses, damages, claims, actions and any liability of any kind resulting from or arising from any breach of representation made by entrant in connection with the Skill Challenge, the exercise by Sponsor or its designees of any of the right granted by entrant in these Official Rules and entrant’s participation in the Skill Challenge, including acceptance, possession, use, misuse or nonuse of the prize(s), or any injury or for damage to entrant's or any other person's computer or wireless device relating to or resulting from participation in the Skill Challenge or downloading any materials in the Skill Challenge, or inability to access any website or wireless service associated with this Skill Challenge, or any combination thereof. Entrants agree that the laws of the State of California will govern any and all disputes. As a condition of participating in the Skill Challenge, entrant agrees that as to Sponsor and the Released Parties (1) under no circumstances will entrant be permitted to obtain awards for, and entrant hereby waives all rights to claim, punitive, incidental, consequential, or any other damages, other than for actual out-of-pocket expenses, (2) all causes of action arising out of or connected with the Skill Challenge, or any prizes awarded, shall be resolved individually, without resort to any form of class action, and (3) any and all claims, judgments, and awards shall be limited to actual out-of-pocket costs incurred, but shall in no event include attorneys’ fees. Sponsor reserves the right to modify prize award procedures. If in Sponsor's opinion, there is any suspected or actual evidence of electronic or non-electronic tampering with any portion of the Skill Challenge, or if computer virus, bugs, unauthorized intervention, fraud, or technical difficulties or failures compromise or corrupt or affect the administration, integrity, security, fairness, or proper conduct of the Skill Challenge, Sponsor reserves the right, at its sole discretion, to disqualify any individual who tampers with the entry process, the logging of miles and/or to modify, suspend or terminate the Skill Challenge. In the event that the Skill Challenge is cancelled or postponed for any reason whatsoever, the ARV of the prizes will be awarded to the extent required by law. ANY ATTEMPT BY AN ENTRANT TO DELIBERATELY DAMAGE SPONSOR’S SITE OR UNDERMINE THE LEGITIMATE OPERATION OF THE SKILL CHALLENGE MAY BE IN VIOLATION OF CRIMINAL AND CIVIL LAWS AND SHOULD SUCH AN ATTEMPT BE MADE, SPONSOR RESERVES THE RIGHT TO SEEK CIVIL AND/OR CRIMINAL PROSECUTION AND DAMAGES (INCLUDING ATTORNEYS’ FEES) FROM ANY SUCH ENTRANT TO THE FULLEST EXTENT OF THE LAW. 12. SPONSOR: The sponsor of the Skill Challenge is Rapha. 13. 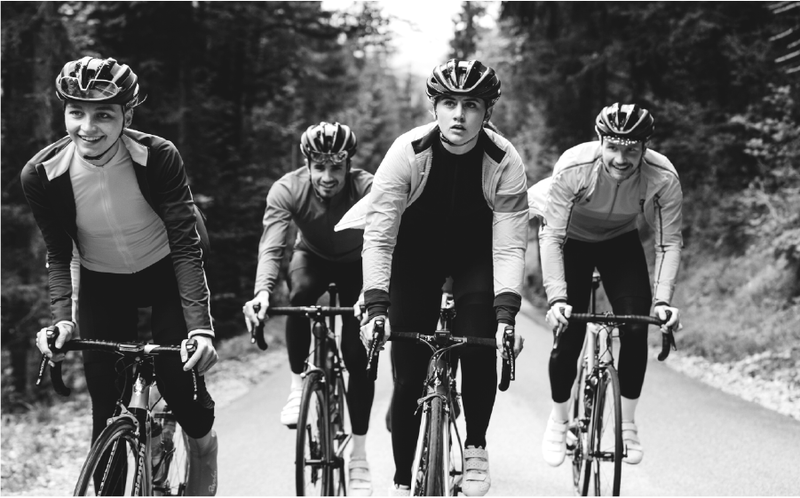 OPT-OUT: If You do not wish to receive any further notices from Rapha regarding future promotional offerings, send Your name and address to: Rapha HQ. Attn: Opt-Out. CONSUMER DISCLOSURE: NO PURCHASE OR PAYMENT OF ANY KIND NECESSARY TO ENTER OR WIN. A PURCHASE WILL NOT INCREASE YOUR CHANCES OF WINNING. You have not yet won a prize. The actual odds of winning any prize will depend upon an entrant’s ability to complete the Skill Challenge. Skill Challenge ends on 12/31/2017. See Official Rules above for entry requirements and complete prize restrictions. Sponsored by Rapha HQ.